With two episodes to the end after this adventure, Doctor Who serves us up a murder mystery type episode complete with bowler hats, accents and stubborn horses. The preview last week didn’t fill me with joy, or even give me an inkling that this story might be any good. But with Mark Gatiss back at the writing helm there was always a possibility, and this episode delivered. The fantastic Jenny and Madame Vastra are back, solving mysteries and filling me with joy. Their Sontaran butler come security guard Strax is a delight as ever. Lady Ollena Tyrell from Game of Thrones takes a break from sparring with Tywin and Tyrion Lannister to play Mrs. Gillyflower (Diana Rigg is a marvellous woman and actress) and I have no idea where all the chatter on the internet is coming from about Matt Smith losing his spark, but it’s nonsense. He’s just as magnificent in this story. Perhaps the surprise breakthrough is Rachael Stirling as blind Ada. What a heartfelt and stunning performance! Enough chatter, let’s go under the cut for some of the detail about what made The Crimson Horror an especially ‘Who’ episode. The general premise is this. People are turning up in 1893 Yorkshire dead and with glowing red skin. Concurrently, Mrs. Gillyflower is preaching the end of the world and signing people up to her new town, Sweetville, whose inhabitants will be saved from the pending destruction. Of course, no one is heard from again once they enter. 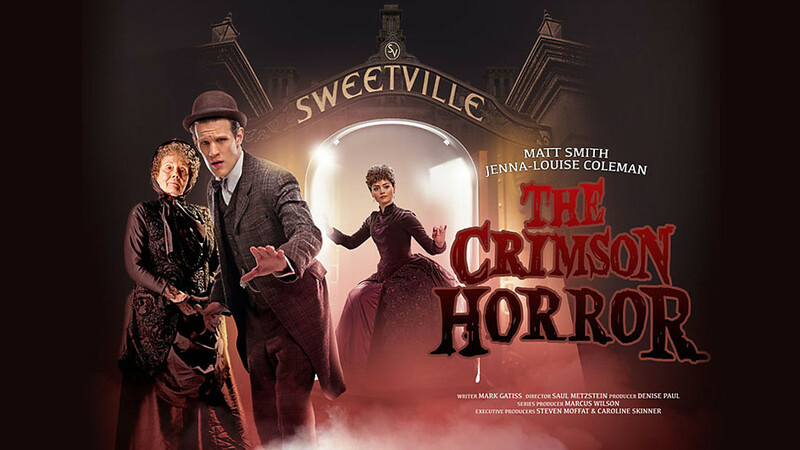 Jenny goes to Sweetville to investigate and finds the Doctor there, red and unable to speak. Once he has fixed his condition he explains to Jenny that Mrs. Gillyflower is selecting the best and brightest and dipping them in red goo to preserve them. Sometimes the process goes wrong and these are the dead victims who have been showing up around town. The Doctor was saved by Ada, Mrs. Gillyflower’s blind daughter, desperate for a place of salvation in the new world, her mother’s blessing and to keep the Doctor as her ‘Monster’, a reminder of God’s grace. Now free, the Doctor needs to save Clara, who has been preserved, and stop whatever Mrs. Gillyflower’s dastardly plan is... which ends up being the destruction of mankind. 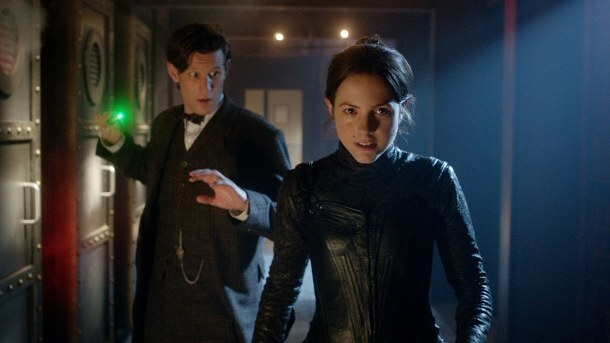 Every time I see Jenny and Madame Vastra are in another adventure, my heart jumps a little. The Silurian are an interesting race and Madame Vastra is played excellently by Neve McIntosh. Her make-up is astounding and the attention to detail makes her a beautiful creation of the Who team. But this episode belonged to Catrin Stewart’s Jenny. She was daring and brave in a way that the Doctor’s companions should be, and it’s awesome to watch her at work. The sassy move she pulls when Mrs. Gillyflower’s cronies are about to take both her and the Doctor is genius, stripping out of her bonnet and dress to reveal an arse-kicking leather ensemble that she takes the cronies on in. I wish there had been more, though the comic relief of Strax screaming in, guns blazing, and saving the day was brilliant as well. The fact that Jenny and Madame Vastra are married seems to have been toned down since Christmas. I don’t know if they have been told to not so boldly show the characters are gay, but the feeling was very different from the Christmas special. Nonetheless the relationship works for me. As it turns out, the Silurian have seen this red poison before; it nearly wiped out their race. It is the secretion of an alien leech. As it turns out, Mrs. Gillyflower’s silent partner Mr. Sweet, for whom Sweetville is named, is her own leech who has formed a symbiotic relationship with her. What’s her story? Nothing really. She’s just mad as a hatter; the ‘wrong hands’ as she describes. Diana Rigg is fantastic as Mrs. Gillyflower, unhinged and completely unforgivable. The Doctor reveals that Ada was blinded by Mrs. Gillyflower experimenting on her to inoculate herself against the venom. Such a despicable crime sickens both Ada and our heroes. When a dying Mrs. Gillyflower, plans of destruction thwarted, asks Ada for forgiveness Ada responds with “Never”. In true form Mrs. Gillyflower says “That’s my girl”. The Doctor shows real care and compassion for Ada in this episode, right to their parting. This is something missing from his relationship with Clara currently. The two of them don’t completely click in this episode, though there are moments, Clara smashing the machine with a chair for example, where there are sparks. It’s getting better slowly, but it’s also possible that the Doctor is keeping his distance because he is confused by her existence and doesn’t want to get too close. It couldalso simply be as Paul Verhoeven said this week, that “Moffat endlessly, clumsily tells us we should fall in love with his characters. RTD SHOWED us WHY we should love his”. I’m not sure about the kids Clara babysits finding out about her time-travelling adventures, but given next week’s Cyberman tale is written by Neil Gaiman, I am fairly sure it will be done well. A refreshing change this week to what we have seen of Clara’s run thus far. Let’s hope the last two of the season deliver!